This fine aniseed-flavoured aperitif is made high in the Luberon hills, near the Provence town of Forcalquier, by Distilleries et Domaines de Provence, who have been creating apéritifs and liqueurs for more than 100 years. The recipe for Henri Bardouin Pastis calls for 48 locally grown herbs. Alliance of star anise and other plants 1 spices which make the richness and the taste of provence High in the hills of the Lubéron, in the Provencal town of Forcalquier, Distilleries & Domaines de Provence have been creating fine aperitifs and liqueur for more than 100 years. 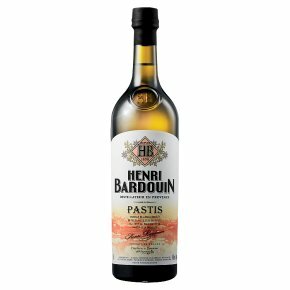 Pastis Henri Bardouin is made to an authentic recipe of 60 herbs and spices, principally star anise and other spices which have traditionally arrived at the nearby port of Marseille, infused with natural herbs from the surrounding hillsides of Provence. Pastis Henri Bardouin is so flavoursome that we suggest you enjoy it well-diluted, with six to ten times the volume of water to Pastis. Add a few ice cubes to taste, but after adding the water.